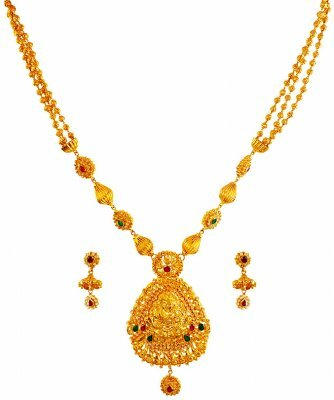 22karat Gold Temple Necklace and Earring set. Necklace Set is beautifully designed with studded Ruby and Polki type stones. Necklace is embossed with Hindu Goddess Laxmi Ji sitting on a Lotus flower. Necklace chain is designed with gold balls in an alternative pattern. 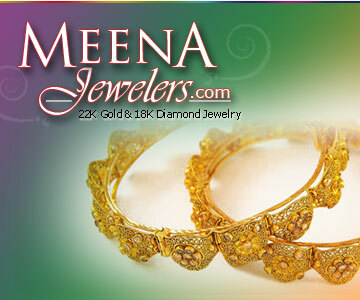 Necklace pendant and earrings has polki type stones which adds beauty to it. Necklace is 24+ inches long adjustable. Center pendant is 86 mm long and 50 mm wide. Earrings are 32 mm long and 16 mm wide.